Father grew up in Coventry Township, south of Akron. He attended St. Francis de Sales in Akron, OH, and graduated from Coventry High School. While pursuing a Math Education degree at Kent State University, he coached wrestling – a sport in which he actively participated during his youth. He graduated from Kent in December 1997, and entered St. Mary’s Seminary in 1998. Father graduated from St. Mary’s with a Master of Divinity Degree and was ordained as a priest for the Diocese of Cleveland on May 15, 2004. Serves as the Spiritual Support for Lakewood Catholic Academy. Bishop Lennon has assigned Fr. Deogratias Ruwaainenyi to be Hospital Chaplain at Fairview Hospital effective June 10, 2014. Fr. Deogratias will reside in residence at Saint Clement Parish. Father is willing to help with Masses at both Saint Clement and Saint James Parishes. Born 10-2-1951 in Columbus Ohio; fifth child of six. Married to Gerilynn [Geri] on 8-25-1972 and have two children and three grandchildren. Deacon Danny Graduated from Franklin University of Columbus in 1975 with a BSBA and Case Western Reserve University with a Master’s of Organization Development and Analysis in 1986. He began his work career with Ohio Bell in 1970 as a lineman and moved through the organization in various capacities until retirement in 2000 as a Human Resource Manager. After retirement from Ohio Bell [AT&T] he volunteered for Freedom House a halfway center. The women’s annex was located at St. Clement for some time. His volunteer experiences lead him to take the exam for Chemical Dependency counseling. In 1995, Danny began teaching as Adjunct Faculty for Tiffin University. In 2002, Danny started working as a counselor at Grafton Correctional Institution; in 2005 he became Director of Re-entry for the Center for Families and Children; and, in 2009, took on the direct service case management position with Community Re-entry. Danny hopes to become certified as a Life Coach with primary focus in the areas of personal and spiritual development. Geri and Danny became members of the St. James community in 1977. 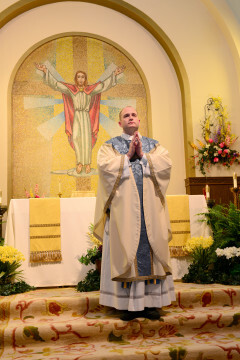 They began formation for the Diaconate in September 2004 and Danny was ordained a Deacon to the Diocese of Cleveland in May 2008; appointed to St. James at ordination until closure and re-assigned to St. Clement in 2010. As a deacon, aside from the ministry at the altar, he works as a member of the RCIA team and the Spiritual Development committee; assists in the preparation of engaged couples; and as needed, assists with funerals, baptisms, and weddings. Danny and Geri both state they have “found a home at St. Clement” and Danny is also pleased to be able to reconnect with St. James. Mr. Flood received his bachelor’s and master’s degrees from Peabody Conservatory in Baltimore, where he studied under world-renowned classical guitarist Manuel Barrueco. He has 26 years’ experience offering guitar instruction and has his own guitar teaching studio, James Flood Guitar Lessons Click Here. James, his wife Jeanette, and their six children are parishioners at St. Clement’s. James Flood has conducted choirs for 21 years, holding posts at several churches, including the Cathedral of Mary Our Queen in Baltimore. He is currently the choral director of the Schola Cantorum of the Lyceum, a grade 7-12 Catholic liberal arts school in South Euclid. 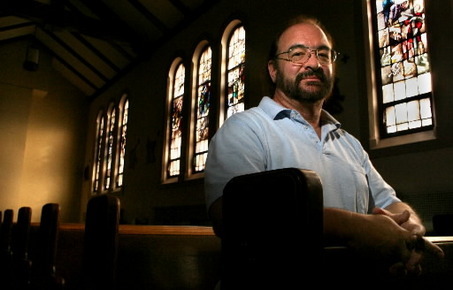 James is also the founder and president of The Foundation for Sacred Arts, a Catholic nonprofit organization that seeks to stimulate a movement in new sacred music, art, and architecture. Allison is the business manager for both St. Clement Parish and St. James Parish. Susan has been the Parish Secretary at St. Clement Church since August 2002. A longtime resident of Lakewood that has 2 sons. She enjoys greeting all the different people that come to visit the Rectory at St. Clement. She considers it a great gift to serve the parishioners and staff of St. Clement Parish. She enjoys reading, cooking and spending quality time with her family. She began musical studies at Moody Bible Institute in Chicago, Illinois where she obtained a diploma in sacred music with a piano emphasis. She went on to Wittenberg University in Springfield, Ohio to obtain her Bachelor’s of music education with a piano and voice major. She furthered her vocal training by receiving here master’s degree in vocal performance from Northwestern University in Evanston, Illinois. Janet has two grown daughters, Elisabeth and Olivia, who both majored in cello in college. Daughter Olivia is on the musical staff of Fairhaven Church in Dayton, Ohio, where she plays cello weekly with the church orchestra. Janet retired from teaching vocal and instrumental music in Mansfield City Schools in 2015.